Disney Springs is always growing and improving, and there’s never been so much to see, do and experience there! So we can understand if you don’t have time for a sit down meal. Luckily, there are plenty of grab and go food options for you and your family. Whether you want to snag a quick snack, an on-the-go dessert, or an entire portable entree, there’s something for you here! This popular Canadian dish at The Daily Poutine features French fries and cheese curds, topped off with hot gravy, to create a gooey, delicious, feel-good food that you can carry around Disney Springs with you. You can also try a twist on classic poutine with the Latin, French and Italian versions. We’ve raved about Ghirardelli before, and for good reason – we love everything on the menu! And happily, their ice cream sundaes are perfectly portable for your busy day in Disney Springs. Each one features delicious Ghirardelli chocolate, and you can choose from a variety of flavors, including sea salt caramel, black cherry, mint, butterscotch, and espresso. Just because you’re on the move, doesn’t mean you can’t enjoy a steak dinner! Head to the trio of rotating food trucks at Disney Springs’ Exposition Park, where Springs Street Tacos Entrées offers a tantalizing Steak Taco. It’s made for guests on the go, and it comes with avocado cream, pico de gallo, cheese, and a healthy dose of jalepeno. When it comes to food on the go, nothing beats pretzels! And your gourmet pretzel needs are covered at Disney Springs by Wetzel’s Pretzels. You can explore all their varieties, including cheese, pepperoni, almond, cinnamon, and sour cream and onion. And whichever you pick, there’s a dip to complement your pretzel. Carnivores, look no further! The Slider Trio at Polite Pig is calling, and you’re going to want to answer. It features three bite-size burgers: Southern Pig, Prime Brisket and Smoked and Fried Chicken. We love that they’re smaller and easier to eat on the go than a larger burger, and that you can try all three flavors in just one dish. Scoring points for originality and yumminess, this bubble waffle at Aristocrepes is as light as air, and filled with chocolate ice cream. But the to-go goodness doesn’t end there. You’ll also find caramel sauce, crispy pearls, pretzel pieces, and lots of whipped cream. And it’s all wrapped in a delightfully portable exterior. Munch away! Chef Art Smith’s Homecomin’ Kitchen has an entire section of their menu devoted to grab and go items to accommodate busy guests just like you. Our pick is the Fried Chicken Sandwich. The chicken is marinated in buttermilk and double-battered, and then served with hot sauce aioli sauce (which is surprisingly spicy!). You’ll even get it boxed up with some cutlery and napkins, perfect for guests with no time to stop and sit. Fans of Morimoto, rejoice – even if you can’t snag a reservation for the sit-down restaurant, or are short on time, you can check out Morimoto Asia Street Food for some grab and go items. And of course, one item you can’t miss is the sushi! We recommend the Shrimp Tempura Roll. It’s rolled in cellophane, and couldn’t be easier to eat on the run. It’s super fresh, and comes with lettuce, cucumber and crispy shrimp. Craving a hotdog with a little extra oomph? How about three? We love the 3 Little Pigs Trio at B.B. 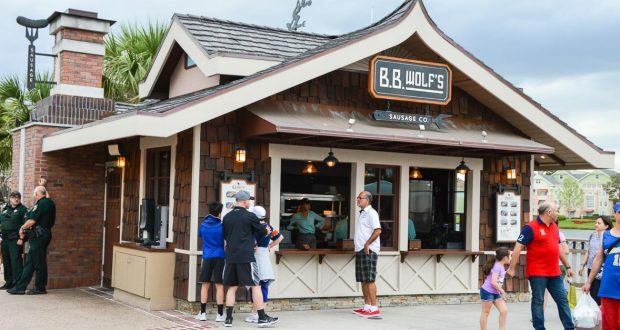 Wolf’s Sausage Co. In one dish, you’ll be able to sample three delicious hotdogs (and let’s not forget the homemade pickles! ): Italian, Latin and Greek. Don’t worry, veggiesaurs, we haven’t forgotten you! Earl of Sandwich has a mouth-watering sandwich that we think might even be a hit with the meat-eaters in your family – and you can eat it on the go. It features red peppers, cucumbers, onions, and Roma tomatoes, and comes with feta, lettuce and Mediterranean dressing. Salad has never been so exciting – or so portable!